One of the greatest joys that Life provides is the pleasure of having a good meal with friends or family. People are talking and laughing with the sound of forks hitting plates creating a light percussion in the air. Or maybe the good meal is at a bar with friends, with loud music and high excitement. Or maybe the good meal is at a campfire in the woods after a long hike. Chances are, in any of these locations, people are going to want a drink. The beverage flowing more and more around the tables of the world is beer. Just like wine, beer craves to be paired with the perfect plate to enhance the meal and make it memorable. However, the idea of pairing beers with food is intimidating. Think about it; wine, while complex, falls into two basic categories, red or white, and is made from one basic ingredient. While this is a massive oversimplification, it does make the job of pairing food with wine much easier. But what is a curious drinker to do about beer? Multiple colors, multiple varieties, multiple grains, multiple tastes and textures and profiles and bubbles…so intimidating, I think you need a drink. Don’t be intimidated. Just step into the party. Yes, there a multitude of beer varieties, but there are also countless food varieties, and chances are, if you pick a good beer and drink it with a delicious meal, you’re going to enjoy it. There’s much to discover, and many beers to try. But before you begin crafting your menu , try these quick tips. Hopefully your own skills and senses can come to your aid so that the answer for pairing food with beer is already solved. The first and most basic trick to pairing beer with food is this; Use your senses. Taking a good long whiff of your beer can key you in to the flavors that are apart of it. Does it smell bitter? Sweet? Smoky? Your nose is excellent at distinguishing flavors. Use it to your advantage. You can match flavors together based on this step. Then, take a small sip of your beer. What do you taste? Is the beer heavy, or light? Think about the overall balance of the beer…what do you taste clearest? Is the beer obviously bitter? Can you taste fruits and spice? Coffee and caramel? Whatever the answer to these questions, using your senses can narrow your search for the perfect food pairing. The next challenge with food pairing is deciding between contrast and compliment. Beer and food that complement each other are a good marriage, think stout and dark chocolate cake. Both are dark and heavy, with sweetness and bitterness playing equal parts. If you taste a strong flavor in your beer, try to find a food that matches it. But foods that contrast each other are like the couple who epitomize ‘fire and ice’. Food and beer that contrast each other are probably not similar, but set each other off and light fireworks. An example of this might be a heavy or cream-based course, like fettuccini alfredo, paired with a crisp, bitter, bubbly IPA. The effervescence will cut the fat of the cream and create a memorable contrast. One of the most interesting elements of contrast are the bubbles, or effervescence, in beer. These bubbles make beer refreshing and make you sigh, “aaaah” after a hearty sip on a hot day. Use the effervescence to your advantage. The bubbles can lighten and enliven heavy dishes, and are your key to interesting contrast. The next tip to remember with food and beer pairing is fairness. Don’t let one dominate over the other. If you’re enjoying a light dinner, like a salad, go for a light beer like a Belgian wheat beer or a nice bright lager. If you’re gnawing through a 10 oz. steak with a side of roasted mushrooms, go for a bold beer like a porter or stout. The key is to achieve harmony. Now, what about spice? Spicy foods are popular the world over, and deserve a good beer pairing. However, deep in a laboratory somewhere in the world, scientists have discovered that alcohol intensifies spice. If you’re adventurous or intruigued by the possibility of a red face and tearing up in public, go for it and pair a high-alcohol content beer with chiles and jalapenos. But if you want your beer to refresh you and calm the spicy fire, go for a beer with a lighter-alcohol content. These are the keys. 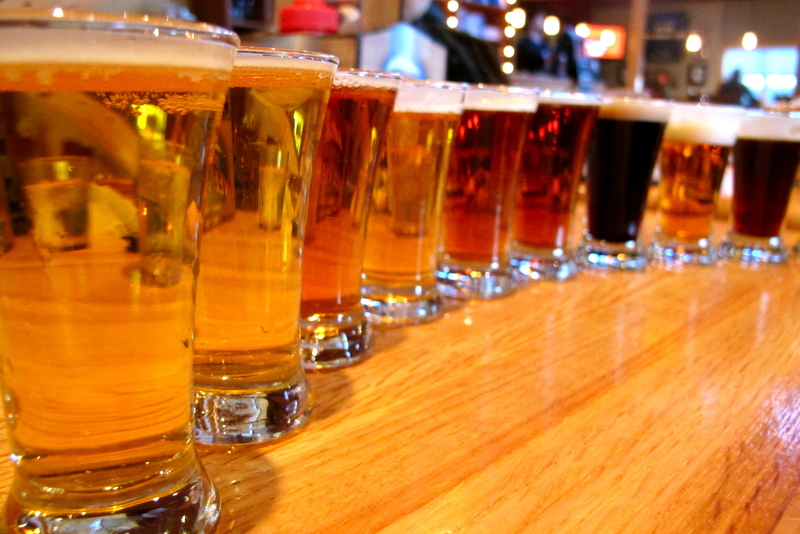 It’s helpful to have a firm understanding of what beers you like and why you like them before beginning to pair. By knowing what you like, you’ll have a good understanding of the aromas, intricacies of flavor, and feel of the beer. You’ll know which foods will go well with it. And experiment! Even if you pair an imperial IPA with a bowl of cereal, making mistakes is always the best teacher and beer is an adventure. Have fun and buy good beer. The adventure awaits!